Ancient gunk confirms dino-bird link? 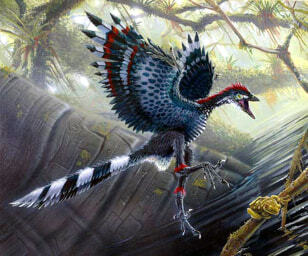 Archaeopteryx, shown here in an artist's rendering, is believed to be the world's earliest bird and a descendant of the dinosaurs. The crow-sized creature lived about 150 million years ago. Some scientists believed it soared down from tree tops with the aid of four limbs covered in winglike feathers. Archaeopteryx's feathers and birdlike wishbone — along with reptilian features such as a long bony tail, claws and teeth — are seen as strong evidence that birds evolved from dinosaurs. Click on the "Next" button to learn about eight more scientific links in the transition from dinosaurs to birds. Strong support for the dinosaur-to-bird transition came with the discovery of two birdlike eggs inside a fossilized female dinosaur. One of the pineapple-sized, potato-shaped eggs is shown here. The blue color of the shell fragments is added for effect, though the texture is likely realistic, scientists say. The dinosaur, a theropod, could produce two eggs at a time — a capability that lies somewhere between that of primitive reptiles and birds, suggesting a dino-bird linkage. Theropods are considered the closest dinosaur ancestors to modern birds. Reptiles lay a clutch of eggs at once; birds lay one egg at a time. Scientists suspect birds only produce one egg at a time as a means to lighten their load for flight. 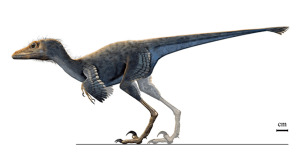 Male meat-eating dinosaurs such as Troodon, shown in this image, are among the dinosaurs that scientists say guarded nests and brooded developing eggs much the way some birds do today. Daddy day care is the norm among large flightless birds such as emus and rheas, for example. In more than 90 percent of living bird species, males participate in parental care of the young, scientists say. The dino-nest-guarding dads likely freed up moms to forage for meaty meals that allowed them to lay bigger, or more, eggs, which would have increased their chances at reproductive success. It's possible, the researchers add, that the dinosaurs' nests contained eggs from several females, a trait found in ostriches today. Soft tissue found inside a 68-million-year-old Tyrannosaurus rex leg bone dug up in Montana has provided compelling evidence that modern birds are the descendants of dinosaurs. The soft tissue, or gunk, contains collagen proteins. Scientists decoded these proteins and compared them with those of 21 living organisms. They found the dino proteins line up most closely with birds — an ostrich and chicken — than with any other creatures, including alligators and lizards. 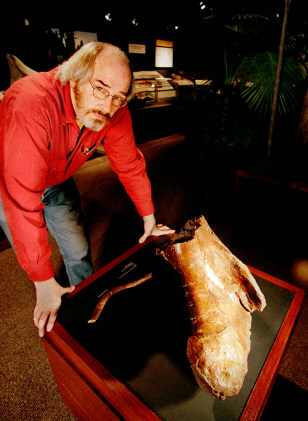 In this image, Montana State University paleontologist Jack Horner stands with the T. rex leg bone that yielded the telltale gunk. Small size is considered a prerequisite for flight, an adaptation scientists had thought occurred in the earliest bird lineages that eventually took to the skies. But remains of the 2-foot-long dinosaur named Mahakala omnogovae, unearthed in the Gobi Desert and shown here in this artist's reconstruction, suggest that small size was already a common feature among some dinosaurs in the dinosaurian lineages most closely aligned with birds — the dromaeosaurids and troodontids. Small size might have evolved before other flight innovations, scientists say. An 85-million-year-old carnivorous dinosaur unearthed in Argentina had a breathing system of bellows, or air sacs, which helped pump air through its lungs. Today, only birds breathe in this manner. 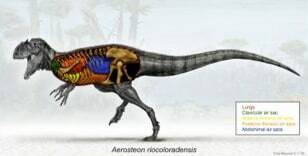 The bones of the dinosaur, named Aerosteon riocoloradensis, have telltale pockets and a spongelike texture called pneumatization in which air sacs from the lung invade the bone. 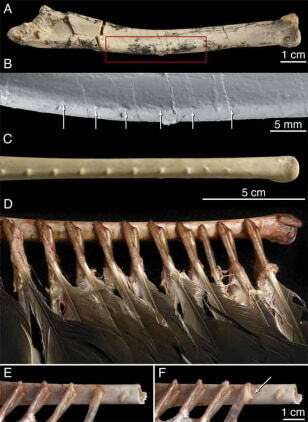 Though Aerosteon likely had feathers, scientists say it did not fly. Instead, the birdlike breathing system likely evolved to help keep the tipsy two-legged runner more balanced — or perhaps it was a cooling mechanism. In this artistic rendering, the lungs (red) are surrounded by air sacs in other colors. 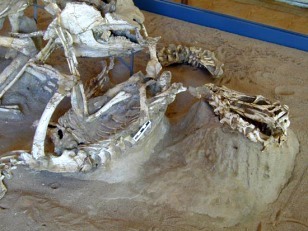 Meat-eating dinosaurs such as the velociraptor shown here had breathing structures called uncinate processes that are also present in birds, researchers have found. 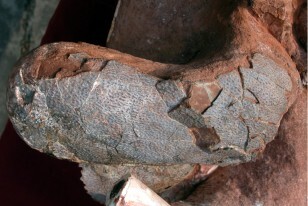 The finding adds another layer of evidence linking birds and dinosaurs. Uncinate processes are small bones that act as levers to move the ribs and sternum during breathing, explains Jonathan Codd of the University of Manchester. In a comparison study, he and colleagues found the meat-eating dinosaurs had long uncinate processes similar to those in diving birds such as pelicans and cormorants. Velociraptor, the fleet-footed dinosaur made famous by Hollywood in the movie Jurassic Park, had feathers, according to a fresh analysis of a forearm unearthed in Mongolia in 1998. The fossil (A in the image above) shows six evenly-spaced quill knobs (B) — bumps where secondary feathers attach to the bone. The same bumps are also shown on a turkey vulture forearm (C). The turkey vulture's feathers (D) and quill knobs (E and F) are also shown. "If animals like velociraptor were alive today, our first impression would be that they were just very unusual-looking birds," said Mark Norell, a curator at the American Museum of Natural History in New York. 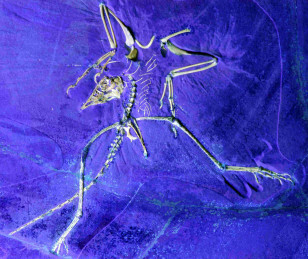 Archaeopteryx, the earliest known bird, had dinosaur-type feet, according to analysis of the well-preserved fossil shown here. Modern bird feet have a backward-pointing hind toe that helps birds cling to branches and power lines, for example. The Archaeopteryx fossil, however, reveals a first toe extending from the side of its foot, like a human thumb. 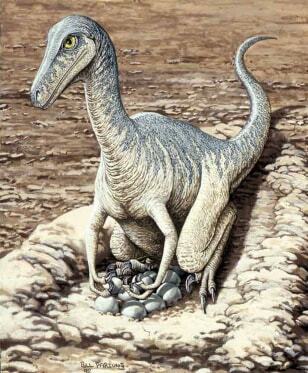 The configuration is more similar to that of dinosaurs such as velociraptor, which was fast and ran on two feet. The similarity, scientists say, adds to the argument that birds arose from dinosaurs.